There is a key, but Democrats haven’t a clue as to how to slip it in the lock. In their present state of denial they have zero chance of gaining ground in either the 2018 mid-terms or the 2020 general election. Chuck Schumer, Nancy Pelosi, Hillary and Bill Clinton think they got blind-sided and simply a tweak here and a minor adjustment there will bring them the success they were fixated upon. Republicans and their Democratic co-conspirators haven’t done a thing for the bottom two-thirds of America for two generations, ever since Ronald Reagan (the Great Communicator) wrecked the unions and privatized everything he could get his hands on. It’s been a race to the bottom in America ever since. We finally ‘trickled down’ to Trump and his election makes perfect sense. That’s prologue. Let’s get down to the key. Step number one is to listen instead of denigrating. Calling Trump supporters idiots and clueless misfits not only shuts down dialogue and it’s wrong at its core. These individuals have been beaten out of the mainstream economy and watched their lives get steadily worse for forty years. Step number two is obvious and even Trump has missed it. He promised hope of better things to these people, as did Barack Obama. President Obama failed to deliver that hope over eight years, but Trump sold his voters down the river in six months. Bush the father and Bush the son are in that mix as well. In 2015, 64 of the world’s wealthiest individuals had assets equal to the bottom half of the planet. One year later, in 2016, that number had shrunk to 8 individuals. One of those eight is 33 year-old Mark Zuckerberg, co-founder of Facebook, a company that didn’t even exist until 2004. He is currently worth approximately 73 billion dollars, the fifth richest man on the planet. Does that sound even remotely sustainable? So, of course the bottom two-thirds of America are pissed. The bottom half are stuck in below minimum-wage, no contract jobs, without health insurance or savings. The next 16% are scared shitless of joining them by being downsized, outsourced or otherwise made redundant. That totals a landslide in the Electoral College for Mr. Trump. It seemed like, but was not quite Hillary’s turn. (Sept 12th, 2016) Last week, a new poll showed just how far this anxiety reaches in the U.S. According to a survey by the NHP Foundation, 75 percent of Americans are worried they could lose their homes, while 83 percent of respondents said that they were concerned about the rising costs of housing. I won’t continue to list statistics, because as we know, if you torture statistics sufficiently they will confess to anything (From Darrell Huff's 1954 book How to Lie With Statistics). 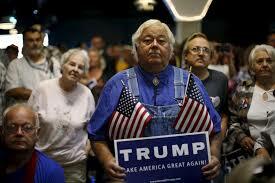 My point is that Trump supporters are not ignorant or a wild-eyed fringe group, they are honest, hard-working American citizens who have had a belly-full of being abused. (Forbes) A failing coal industry can no longer afford keep its promises to pay health and pension benefits to retired coal miners, who have toiled underground for 20 years or more and who may have emerged with significant health ailments. What now? Maybe you’re a trucker. That’s a good, solid blue-collar job. Read Rigged, from USA Today: Trucking companies force drivers to work against their will – up to 20 hours a day – by threatening to take their trucks and keep the money they paid toward buying them. Bosses create a culture of fear by firing drivers, suspending them without pay or reassigning them the lowest-paying routes. Name a single thing Democrats or Republicans are doing for this vast majority of Americans. Bernie Sanders could have beaten Trump, because he had the same message and spoke to a broader range of the same dis-enfranchised. But he was torpedoed by a Democratic National Committee hell-bent to give Hillary her turn and a national media that presented Sanders as a great guy who could not win. Is it time for Democrats to make Bernie their cheerleader, instead of a lonely voice? Is it time for the Chuck Schumers and Nancy Pelosis to step aside? Is there currently an untainted rising star in the Democratic Party? If Trump supporters and those who oppose him fail to find the key to listening to each other and responding with respect, the nation will tear itself apart in the chaos that follows.